RRB Exam Center 2018 for the various examination conducted by Railway Recruitment Board will release on the official website. RRB ALP CBT 2 Exam Center is released on the official website of Railway Recruitment Board. RRB ALP Exam Center for CBT 2 Link is active right now, before the Admit card releases. The candidates can visit the official website of the regional RRBs and check the Exam Center for RRB ALP CBT 2 Exam 2018 -19. Check the Railway ALP CBT 2 Exam City, Exam Date, and Exam Center here. Railway Recruitment Board (RRB) has activated the Exam Center link where the candidates can easily access the Railway ALP CBT 2 2018 -19 exam details. The board has released the exam center details link region-wise. 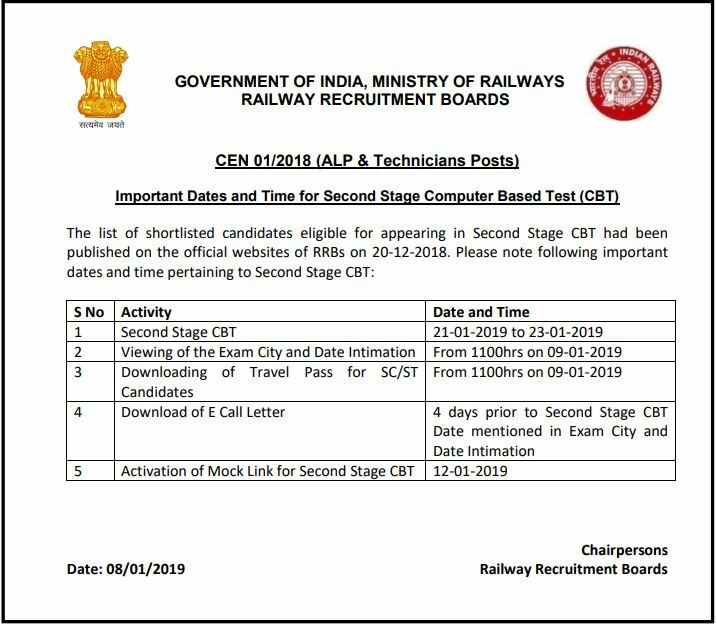 Candidates can also check their Railway ALP CBT 2 Exam Center Details through RRB Candidate Login into respective RRB websites such as RRB Ahmedabad, RRB Ajmer, RRB Allahabad, RRB Bangalore, RRB Bhopal, RRB Bhubaneshwar, RRB Bilaspur, RRB Chandigarh, RRB Chennai, RRB Gorakhpur, RRB Guwahati, RRB Jammu, RRB Kolkata, RRB Malda, RRB Mumbai, RRB Muzaffarpur, RRB Patna, RRB Ranchi, RRB Secunderabad, RRB Siliguri, RRB Thiruvananthapuram. If the candidates belong to the Reserved Category (SC/ST) and if they have mentioned their category in the RRB ALP CBT 2 Application, then they will be provided with Free Travel Authority Pass issued by the Railway Recruitment Board. The RRB Free Travel Authority Pass will be available on the Regional RRB Websites. Candidates can travel to their allotted RRB Railway ALP CBT 2 Exam Center/City by using this Free Travel Pass. The RRB Free Authority Travel Pass is applicable for Railway Second Class Sleeper Seats. The Railway Recruitment Board has released the Admit Card for Group-D on 13th September 2018. The RRB Hall Ticket 2018 is available online on all the official websites of Regional Railway Recruitment Board. The Admit card will be issued to the candidates four days before the commencement of the examination. 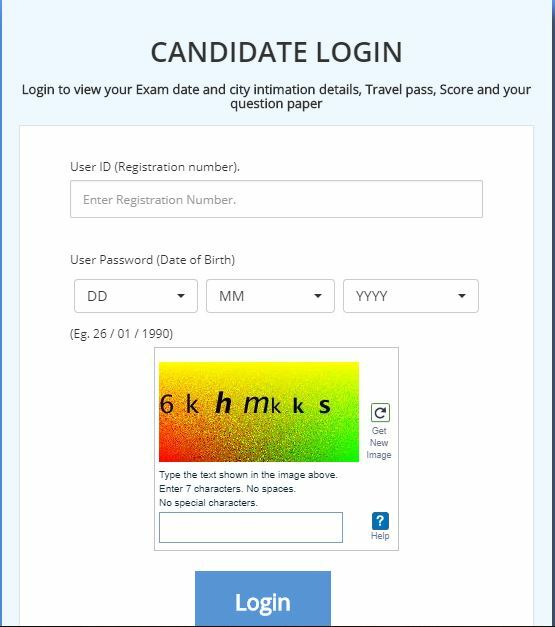 Candidates can download their respective Admit card by entering their Registration ID and Date of Birth. The Admit Card will also contain the complete address of Railway Exam Center in details. Railway Recruitment Board will soon be conducting the RRB ALP CBT 2 Examination as the second level of the selection process for the posts of Loco Pilot and Technician. Recently, in the official notification, RRB announced the tentative date for the second stage CBT examination to be 19th November 2018. The Exam Centers will be declared earlier than the release of RRB ALP CBT 2 Admit Card 2018. Following regions will be conducting the RRB ALP CBT 2 Examination: RRB Ahmedabad, RRB Ajmer, RRB Allahabad, RRB Bangalore, RRB Bhopal, RRB Bhubaneshwar, RRB Bilaspur, RRB Chandigarh, RRB Chennai, RRB Gorakhpur, RRB Guwahati, RRB Jammu, RRB Kolkata, RRB Malda, RRB Mumbai, RRB Muzaffarpur, RRB Patna, RRB Ranchi, and RRB Secunderabad, RRB Siliguri, RRB Thiruvananthapuram. RRB official website will release an active link for the release of RRB ALP CBT 2 Exam Center 2018-19. The CBT 2 Examination is expected to start from 19th November 2018. The candidates can visit the official website and check the Examination Date, Exam City as well as the Exam Center. RRB Exam Center for RRB ALP CBT 2 is expected to release in 2nd week of November 2018. Though the exact center of the respective candidates will be mentioned on the RRB ALP CBT 2 Admit Card 2018 only. RRB Exam Center for RRB ALP CBT 2 2018-19 will release on the official website of the RRB and all the regional RRB official website. The candidates can visit the official website and check and record the exam centers. Following steps can be taken to check the RRB ALP CBT 2 Exam Center 2018. You will now land on the Homepage of the respective RRB Region. Once you click on the Link, you will be redirected to a new page. Now enter the details such as- Registration Number, and Date of Birth (Password). Railway ALP CBT 2 Exam Center details will be displayed on the screen. Download and take the printout of the Railway Exam Center Details of ALP CBT 2. Railway Recruitment Board released an official notification recently. The announcement was made regarding the expected Result date. Along with that, RRB also announced the tentative RRB ALP CBT 2 Exam Dates. RRB ALP Exam Date was announced to be 19th November 2018. Though the confirmed schedule is still due for release. The candidates are advised to start their preparation for the exam. RRB ALP CBT 2 Exam Center link will be active on the official website of the RRB and regional RRB. The candidates can visit the link and check the Railway Exam Date, Exam City and Exam Center for ALP CBT 2 Examination by providing the login details. RRB Railway Group D Exam Center 2018 is active for all candidates scheduled till 17.12.2018. The RRB Group D Exam Center is live on all the regional RRB Websites. Through RRB Group D Exam Center 2018 Link, candidates can check their Railway Group D Exam City, Exam Date for CBT Exam. RRB Exam Center 2018 is released on the all RRB’s Regional official websites. In this article, we provided all the details related to Railway RRB Group D Exam Center 2018. Update: Candidates, Please note – The Railway Group D Exam Center / City and Date information is live for all candidates scheduled till 17.12.2018. The Link to check RRB Group D Exam Center has been released on 9th September 2018 and the Railway Group D Exam Center link will be live until 14th December 2018. The notification regarding the release of the RRB Exam center 2018 is sent to the candidate’s registered number and e-mail ID. Candidates will be able to check their allotted RRB Railway Group D Exam Center/City online by entering their Registration Number/ID and Password (Date of Birth). If you are still confused with the procedure to download or check the Railway Group D Exam Center 2018, we will help you with the procedure of how to check the RRB Exam Center in the next section. How to Check Railway Group D Exam Center 2018 Details? Railway Group D Exam Center details will be displayed on the screen. Download and take the printout of the Railway Group D Exam Center Details. RRB Group D Exam 2018 is scheduled to be held from 17th September to 17th December 2018. The exam will be held on 49 days. 17th, 18th, 19th, 20th, 22nd, 23rd, 24th, 25th, 26th, 27th, and 28th. 1st, 3rd, 4th, 5th, 8th, 9th, 10th, 11th, 12th, 15th, 16th, 22nd, 24th, 29th, 30th, 31st. The Railway Group D First Stage CBT Exam will be held 11 days in September 2018, 16 days in October 2018, 13 days in November 2018, and 10 days in December 2018. If the candidates belong to the Reserved Category (SC/ST) and if they have mentioned their category in the RRB Group D Application, then they will be provided with Free Travel Authority Pass issued by the Railway Recruitment Board. The RRB Free Travel Authority Pass will be available on the Regional RRB Websites. Candidates can travel to their allotted RRB Railway Group D Exam Center/City by using this Free Travel Pass. The RRB Free Authority Travel Pass is applicable for Railway Second Class Sleeper Seats. i am shortlisted for alp cbt2 and iam from telangana. but i got exam center in andhra pradesh. Congratulations on your selection. I guess you are concerned about changing the exam center? I am sorry to tell you but there is no option of changing the Exam Center. It is decided by the examination authority and you must appear in the mentioned Exam Center only. kisi ka centre Goa pada h kya??? aligarh me group d ka center kha jaa rha hai. Hello sir, I’m koteswararao. My registration number is 2880813590. My dob is 10-07-1987.please tell me sir when my exam date and city. Reply sir! you can check your exam date & city to click on the link provided in this article. We will update that soon. You can check our website to get the updates and notifications. Hi sir my exam center is andrapradesh please sir center adders. The Address of your Exam Center must be mentioned in your Admit Card. PWD DEAF on rrb exam 1.30hours the computer online close but missing 30 mini from andhra pradesh dist vizag…. Sir, my registration no. of RRB chandigarh is 1782754907. I am not able to find out Exam date and venue of exam. I am not able to find out exam date and venue. sir my sister applied for RRB exam, she wrote on 26th September, Bot money of Rs. 250 was not given to her by cash/ in account. I paid online through my account. HI HOW CAN I FIND OUT MY EXAM CENTER IN LATUR. GIVEM ME SOME DETAILS ABOUT THAT AS SOON AS.. I have received admit card but not mentioned exam center name on this admit card. download your admit card and the exam center location is mentioned in the admit card. Is it possible to change my exam center . am in kerala but am selected the RRB zone banglore,which are the exam center for banglore RRB Bangalore India.. I didn’t get my exam date..
Aap Apna Actual Exam Center Location Admit CArd me dekh sakte ho. Sir safe student ko janne ka hak hai ki kab exam date hai aur kaha hai bhale hi admit card exam date ke 4 din pahle aaye…Sara India digital ki or Bach RHA hai aur railways hide & sheak khel rhi hai. yes, RRB has already provided the link to check your exam date & Exam city on 9th Spetember 2018. Aap apna Railway Group D k liye Exam city & Exam date, Article me di huyi link par click karke kar sakte ho. uske bad apna admit card exam date se 4 din pehle download kar paoge. Sir my exam center Is tirunelveli but I can’t hear which place In Tirunelveli? you will get the exact center/place in the admit card. You can download your admit card for group d CBT before 4 days of your exam date. you have to check gain your Registration number & DOB in Application form pdf. Try again. RRB group D exam 17th September 2018 se start hai aur 14th December tak chalenge. Exam centre written as shimla on my admit card ….I am not able to understand that where in Shimla I LL go to attend the exam . Due to the technical problem, the link to download RRB Group D Admit card was not working properly. But now the link working properly, you ca download hall ticket easily. Dear Candidate, The Exam City and Date information is live for candidates scheduled from 17.09.2018 to 16.10.2018 only. Your exam is scheduled after 16th October 2018 and the exam details for you will be live in the week of 24.09.2018. Pleease give us the pdf link for knowing exam date and city. you can download rrb hall ticket only 4 days before from your exam date. the link to download RRB admit card for Group d is currently not working. The link will be re-activated soon. sir mera bhi admitcard nhi nikl rhai hai kal aaj exam hai kab niklega plllzzzzzzz help me. i want to download my admit card please help me sir..
Mera exam 18 september but admit card download nahi ho raha hai plz help me? Choose correct RRB Region and Try Again. Or Send your details here again. Is it possible ? i can change my exam center? I have applied for the choice of exam center Kolkata(West bengal) but in my admit card mentioned Bhagalpur(Bihar) which is very far from my house, so why its happened and what should I do for change my exam center or how it will change from Bhagalpur to Kolkata while I mentioned Kolkata during apply. Please reply and help me sir. i need to know the exam date, time and center of the exam please help me out. My exam date is after 16 th october…then when can I get the admit card?And my exam place is guwahati its not a small city..then how can I know exact place where to sit for exam? Please choose correct RRB region for which you have Applied. click on the link which we provided in the article & fill the details correctly. I don’t know computer . if l do not have to do anything . I can not give it . please sir say if there are some ways. I do not know computer. I have nothing to do. There are some things. please do practice with free mock test provided by RRB before going exam hall. Sir my exam city madurai where is the place sir? Which center? you can check your exam center when you will download your rrb group d admit card. sir my admin card is not available to me . hoe=w can i recieve it. Admit Card is released for candidates who have exam on 17th Sep 2018. Please try and download your RRB Admit Card 4 days before your exam date. No, you cannot change your Exam Center. MY HALL TICKET IS DO NOT DISPLAY. The RRB Group D Hall Ticket has not been released yet. The Railway Group D Admit Card 2018 will be available from 13th September 2018 onwards. However, the Railway has activated the link to check the Exam City, Date and Shift. You can check the details by entering your Registration ID and Date of Birth. The Admit card will be issued 4 days before the date of the examination. Read the article carefully for complete details. my state is tamilnadu, but my exam centre is andhra pradesh,now how can i change my exam centre? Sir I am a manipuri,I want to know my exam centre but after log in with my registration no. And date of birth I can not get my exam centre yet sir what to do now? If you cannot see your Exam Center, do not panic. RRB will soon release another link to check the Exam Centre on 13th September 2018. Read the Article to know more. RRB Admit Card 13th September 2018 se available hogi website pe. Kya gorakhpur ka center change hua hai ? my state is west Bengal but my exam city bhuboneswar, how to change my exam city? exam center change nahi krwa sakte h aap. you can’t change Railway Group d exam city or exam center. DEAR SIR,CAN WE CAN WE ABLE TO CHANGE GR D EXAM VENUE? How can I know that when will be my D group exam? click on the link which is provided in the article. and fill the details. JO PATNA RESION SELECT KYA HAI USKA EXAM CENTER KHA AAYEGA ..
Aap Apna exam center / exam city 9 September 2018 ko check kar sakte ho. Sir I applied railway group D from for Chandigarh…but I am leave West bengal…sir i can do group D exam for West bengal??? Dear sir, how can my sister get the exam hall ticket. Sir, when is the exam? We do not know the date for the exam. And the admit card has not even arrived so that you help us. RRB Group D Exam is likely to held from 17th September. When Railway Group D Admit card will be released by RRB, we will inform you through notification. For more updates visit our website frequently. ajmer se form laga hua ke exam center kha aayenge…. I have applied for RRB Kolkata plz tell me where will be my exam centre. the link to check RRB Group D Exam center will be provided from 9th September 2018 at our website. I have Get exam centre but not exact venue details for apearing CBT. how to find my examination center? Sir..my exam centre city is in kerala..now I m in Panjab..can I change my exam city into Panjab? no, you can not change the exam centr for RRB ALP exam 2018. I have applied for the post of group D exam in RRB ajmer board. So Please tell me where is my examination center. .This intimation can be downloaded and printed for your reference. 3.You will be able to download your e-call letter 4 days prior to your Exam Date which will cover all required information, such as Exam Centre details, Roll No. etc. You will be allowed to appear in the Examination on the basis of e-call letter only. Is it possible to change the exam centre.I live in Jammu but my centre for exam is in Srinagar which is more difficult to go there than going to delhi which is about 600 km away from my place . I have applied for the post of group D exam in RRB BENGALURU board. So Please tell me where is my examination center. I have applied for the post of group D exam in RRB CHENNAI board. So Please tell me where is my examination center. Don’t come any msg /e mail to my number so when the exam & which is exam center? Plz get answer me sir. Exams are like now become an tensions no sufficient information is given ,that can make applicant relax. which is the exam center for Coimbatore,must we go to Chennai or we can write the exam at Coimbatore itself .will the exam centers will be printed on the hall tickets itself please tell us because there are freher like me for this exam. i am asking for them also. My name is R.Aswin vignesh from Coimbatore, Tamil Nadu. i have applied for the ALP post, when an how will i receive my hall ticket. where is the exam center at Coimbatore. is there any center in Coimbatore or must i go to Chennai for the examination please inform me sir. Sir how to choose exam centre.is it at the time of application filling only or any other specific time for choosing place of exam center. Sir i want pune as a exam center. so how i do? If I field another rrb zone and my home zone is different. ….then what is my exam centre? yes. RRB exam center will schedule in the same state in which you applied. Sir hpw to select exam center?